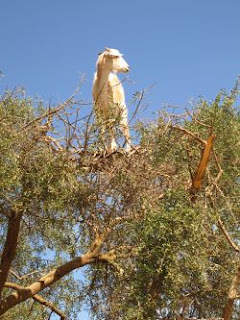 I had many animal firsts on my trip to Morocco with the biggest spectacle being the goats in trees. I still feel like I was hallucinating when I saw 4 legged goats standing upright and still as if enjoying a beautiful pasture, except that they were 20' off the ground balancing on a tiny tree branch. 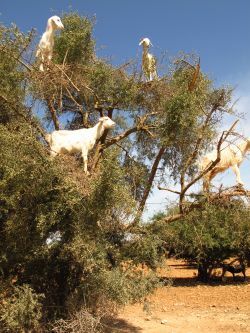 Later in the trip we drove by another goat tree forest, except this time we saw the goats climbing and some were even standing completely perpendicular to the tree. I've never seen anything like it, and I only wish I was able to capture some action shots of these versatile creatures. As if that's not entertaining enough, the goats climb these argan trees to eat the fruit. They process the fruit, but are unable to utilize the nut inside so they "give it up" and some hardworking (and forward thinking) Moroccans collect it, press it, and out comes precious argan oil. You have to wonder what kind of dare took place to find out this amazing oil is a product of that whole process. Actually it was said that single woman first started this business as a way of earning their keep, and when it became popular, everyone wanted in. You may never look at your aragan oil the same. After that, riding a camel seemed sort of anti-climatic. Let's see a camel climb a tree, but a few of us did ride camels on the beautifully secluded beach in Sidi Kaouki. Because they're so large, they sit down so you can get on them, but then they lurch back and forth when trying to get up, which is why they have handlebars on them. They ride itself was a lot more peaceful than I was expecting. I was picturing a gait like an elephant, which wasn't one of my favorite, but the camel is near gazelle-like in comparison. And of course the beach at sunset makes everything peaceful and beautiful. After all of that, riding the mule up the rainy, muddy hill to the Kasbah du Toubkal was like a merry-go-round ride, even despite my lack of rain gear and white linen pants. I was amazed at the load these mules could carry. We saw them carrying heavy, oversized duffel bags full of supplies to the villages, and then of course there was all of our luggage they had to cart up the steep inclines. They're bred for this and don't seem to mind (I hope). And then there were sheep and goats walking everywhere. Sometimes they'd stop traffic as they walked down the middle of the road. Sometimes they'd walk with you on your hikes, and the little ones would energetically try to keep up, even as they stumbled and fell to keep pace. We saw a decent amount of turtles during our stay as well. They'd usually just eat and run...or slowly amble. And of course there always needs to be a garden dog. This is Diva, appropriately named for her wonderful life at Jnane Tamsna.